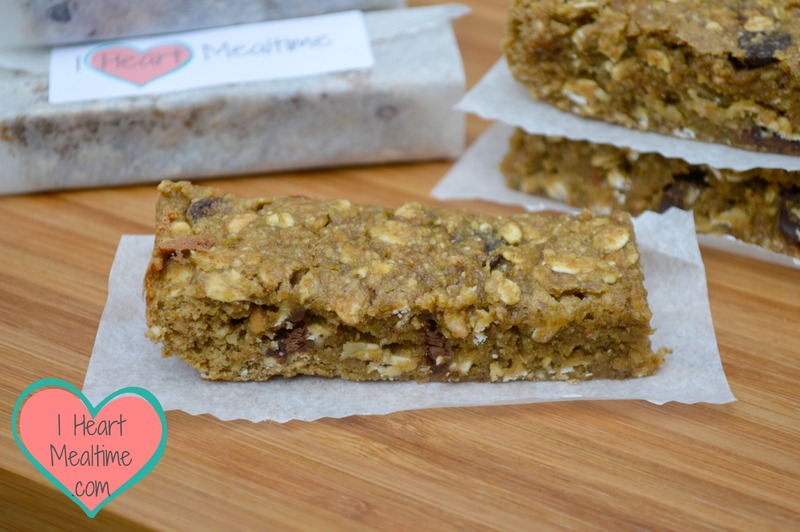 As promised, here are the “picky eater approved” meal or snack bars that I have been working on. 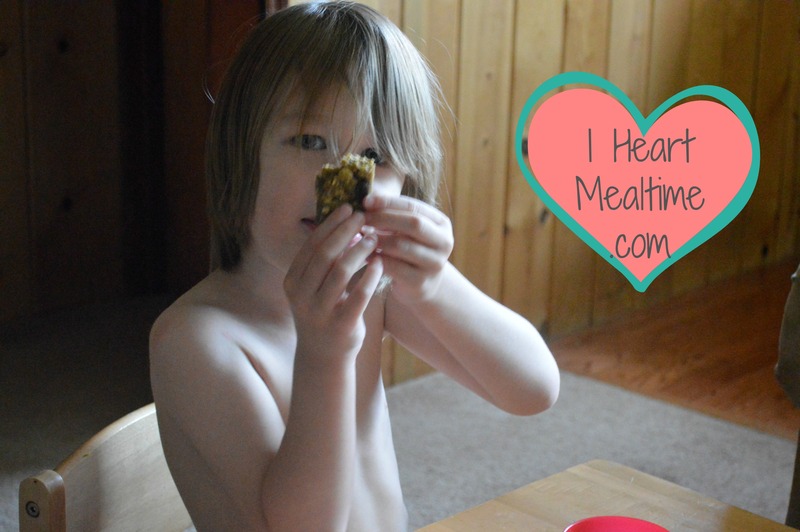 They are protein fortified, Chewy Multigrain Fruit and Veggie Bars with chocolate chips. AND they are delicious, if I do say so myself. Both of my kiddies LOVE granola and cereal bars. They are convenient and portable but trying to find ones that fit my nutritional requirements was pretty tough. They have to be made with fresh, whole foods that are organic and did not contain GMOs. They also have to be relatively low in sugar. While I did find a couple of brands that fit the bill, they were expensive! So, I set out to make my own. 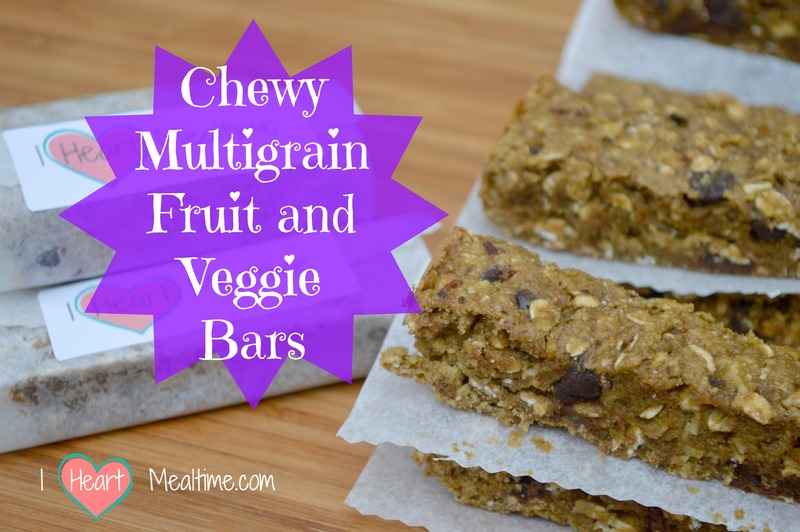 Make a bunch, because these Chewy Multigrain Fruit and Veggie Bars are good! Having a box of pre-made, individually wrapped granola bars is convenient. BUT it isn’t too healthy. AND trying to get as many fresh fruits and vegetables into my picky eaters as possible, was pretty difficult at times. SO, I decided to kill two birds with one stone (but not literally, ewe). One of my requirements for meals or dishes made in my kitchen, is QUICK and EASY. OK, that’s actually two requirements. This recipe has quite a few steps, because I use and prepare fresh fruits and veggies for this dish. So, I use a few make-ahead steps for these bars, to save time, and make double batch. These will stay fresh in the fridge for at least a week. Yes, it is true. I put those fruits and vegetables into this sweet treat! First I go to my refrigerator and freezer and get my pre-made fruit and veggie purees and my date puree. 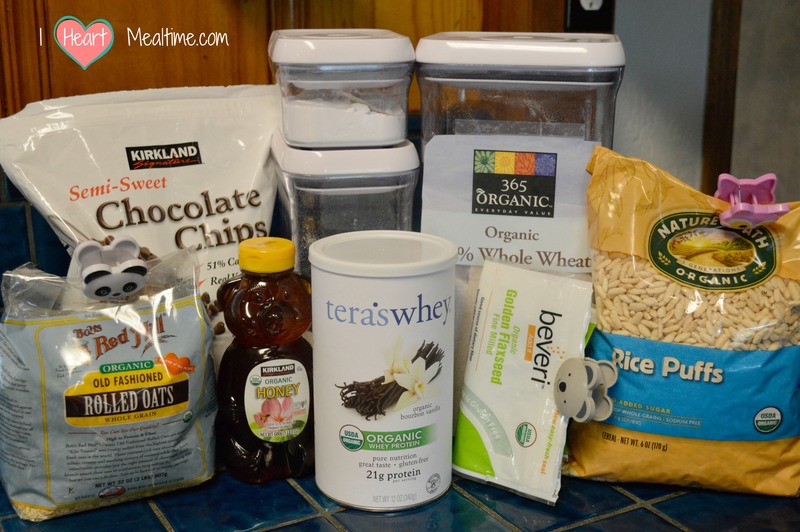 Here is the link for these Make-Ahead Fruit and Veggies Purees and Oatmeal Flour. Once defrosted, these purees become part of my “wet” ingredients. I also add some organic honey to aid in the sweetening and binding of my ingredients. Now for the “dry” ingredients. I add whole rolled oats, steel cut oat flour, whole wheat flour, and ground flax meal to a bowl. That’s a lot of natural fiber-goodness right there. I also decided to add some organic whey protein to this recipe. There are times when my son is too busy being a 3-year-old to sit down for a meal. I wanted these bars to fill him with quality nutrients. I only added 1 serving of my protein powder to this recipe, so these are not like a PowerBar. BUT there is enough protein in these bars to be a filling breakfast or snack. Now that you have your wet and dry ingredients made, it’s time to combine them. You will be surprised to see how moist this mixture actually is. After these are combined, I like to fold in my “extras.” I add puffed rice to this mixture to absorb the extra moisture and give these bars “body.” This is the base for the base for my Chewy Multigrain Fruit and Veggie bars. From here, you can go wild and add what ever else you like. My kids love chocolate! So of course, chocolate chips must be on the list. You could also add dried fruit and nuts if that is your style. I have the oven preheated to 350F degrees. Use parchment paper (NOT wax paper) to line an 11 x 7 rectangular pan. This will make getting your bars out to cut and clean up SO much easier. You could probably spray the heck out of the pan with cooking spray, but why add propellants to this recipe? I made sure that I spread my mixture out as evenly as possible. This will make for uniform bars. Put the pan in the oven for 15 to 20 minutes. I find that 15 minutes in the oven still leaves the bars soft and chewy. 20 minutes makes them firmer, but still chewy. I let them cool for at least 10 minutes then I put the pan in the freezer for 1 hour to help them firm up to make cutting easier. Once firm, I lift the uncut bars out of the pan using my handy parchment paper and begin to cut it into single servings. I cut it in half width wise, giving me two pieces. Then I cut each half, in half width wise again, giving me a total of 4 pieces. Then I cut each of those pieces in half another time, to give me a total of 8 long bars. Finally, I cut the whole pan in half, length wise, to give me a total of 16 kid-sized chewy bars. According to My Fitness Pal’s nutrition calculator, each of these bars contains about 150 calories, 5 grams of protein, and 11 grams of sugar. Not too shabby, huh? Now that these babies are cut up, you can use the wax paper to wrap them individually to keep them from sticking to each other. These chewy multigrain bars keep best in the fridge for at least a week, if they even last that long. I brought them to Jeremy’s preschool for snack time last week, and had the little kiddies asking me for seconds. My number one taste-tester gives them the “picky eater approval.” Try this recipe out and your picky eater might approve of them too. Enjoy! 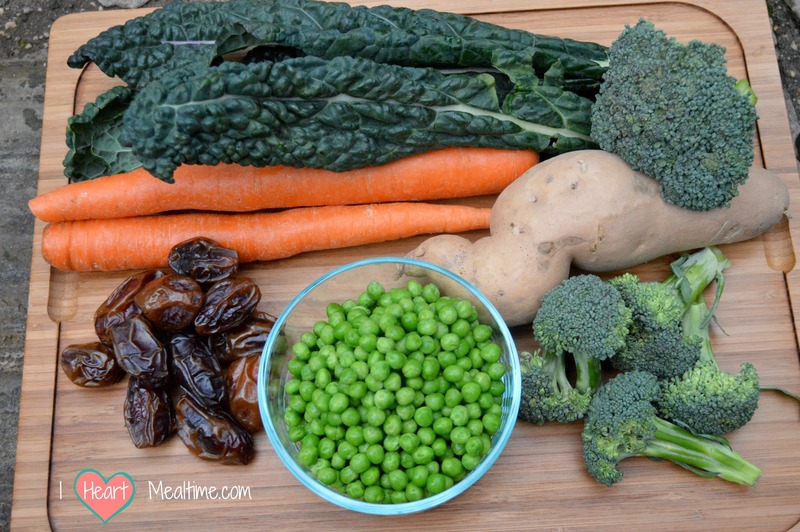 Combine wet ingredients into a medium bowl and mix well. Combine all other dry ingredients into a large bowl except for the puffed rice and chocolate chips. Mix well. Mix wet and dry ingredients together well, until all of the dry mix has absorbed the wet mix. Next, fold in the puffed rice and chocolate chips. Line an 11 x 7 inch baking dish with parchment paper. Spread mixture evenly in pan. Bake for 15 to 20 minutes, depending on desired chewiness. Let cool for 10 minutes, then place pan in freezer for 1 hour to firm up. Removed from freezer, and lift uncut bar out of pan by the parchment sheet. Cut into 16 equal sized bars. Here is the link for the purees : http://wp.me/p4fLKn-78 . Substitute the whole wheat flour for the same amount of gluten free flour. I have made these with Bob's Red Mill Gluten Free All Purpose Baking Flour, and I found that you also have to add 1/8 to 1/4 tsp of xantham gum to aid in the binding of the ingredients. 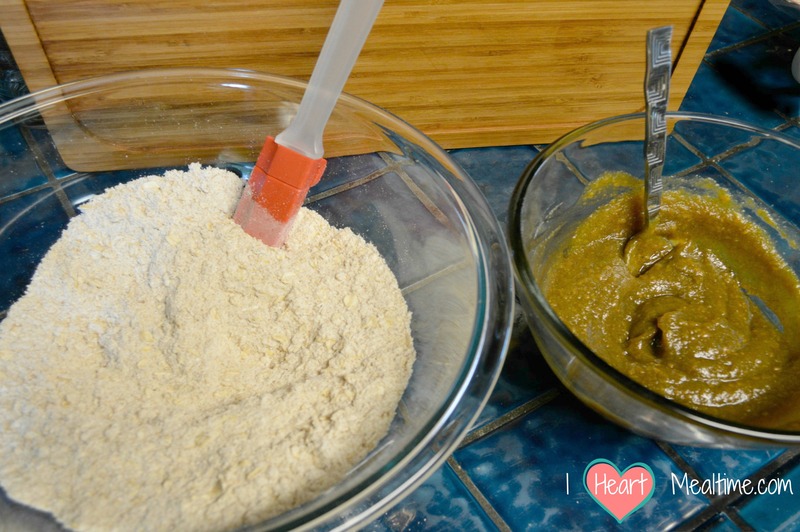 I have not experimented with other gluten free flours yet, like coconut flour or almond meal. If you do, please let me know how that has worked. Enjoy! I had used coconut flour instead of wheat floor and they turned out delicious!! Tes, wonderful! That sounds amazing, I am going to try the coconut flour the next time I make this. Thanks for comment. Hi! These sound great. What can I substitute the flax meal with? Allergic to flax.